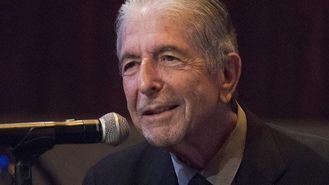 "Well, getting back on the road has improved my mood considerably because I was never good at civilian life," said Cohen, who turns 80 next week. The Canadian songwriter spoke at a listening event in New York City for his new album, Popular Problems, to be released in the US on September 23. The Hallelujah performer was full of good cheer at Joe's Pub, providing laughs for the small crowd of journalists and music industry players. The Rock and Roll Hall of Famer, best known for his dark poetic lyrics, discovered in 2004 that most of his retirement fund had disappeared in a disputed case of mismanagement. His solution was to return to touring. Cohen, who vowed to start smoking when he turned 80, told the crowd when asked if he would start next week: "Yes, does anybody have a cigarette? "But quite seriously, does anyone know where you can buy a Turkish or Greek cigarette?" he said to laughs. "I'm looking forward to that first smoke. I've been thinking about that for 30 years. It's one of the few consistent strings of thoughts I've been able to locate." His new album was produced by Patrick Leonard, best known for working with Madonna. He said he didn't originally plan on releasing Popular Problems the same week of his birthday. "It was a happy accident," he said. "In my family, we have a very charitable approach to birthdays - we ignore them."